May be a good research tool. Phonedeck is a new "cloud dashboard" for Android phones that allows users to sync phone data, gain insights on phone usage, and also to send and receive SMS and phone calls through the browser. The app offers some common syncing options, including contact backup, SMS logs, and social network integration. But Phonedeck's highlight is really the insights feature: the app gives statistics for each of your contacts, letting you know how often you communicate with someone and who contacts who more often. It also analyzes your phone's battery usage and can tell you the live battery level on your device. 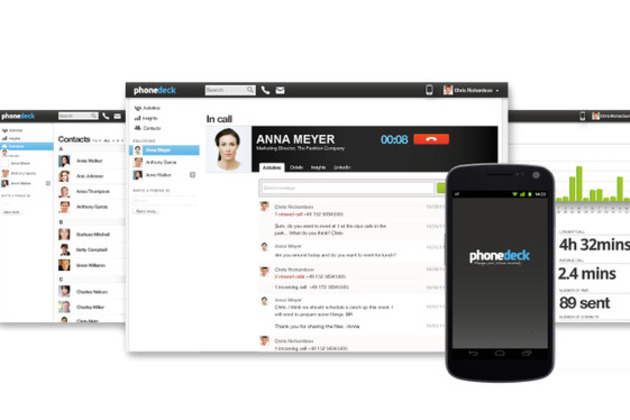 Phonedeck is free, and you can grab it right now from the Google Play store.